In the Maoist era, Chinese leaders had little need for foreign policy advice due to China’s limited involvement in the international community and to the ideological, personalistic, and top-down pattern of decisionmaking under Mao Zedong. The launching of Deng Xiaoping’s reform and opening-up policy in the late 1970s marked the beginning of a process of gradual transformation of Chinese foreign policy from ideology to pragmatism, and from self-exclusion and passivity to greater involvement and active participation in international affairs. The vigorous conduct of diplomacy with 171 countries with which China today has diplomatic ties and in numerous regional and international organizations, combined with the rapid expansion of Chinese interests around the globe, have exponentially increased the Chinese leadership’s need for information, analysis, and advice about the outside world to safeguard and advance Chinese national interests. One of the important means by which this need has been met is through the system of Chinese foreign policy research institutes. Bonnie S. Glaser is a senior advisor for Asia and the Freeman Chair in China Studies at CSIS. Ms. Glaser is also a senior associate with the CSIS Pacifi c Forum and a consultant on East Asia for the US government. Prior to joining CSIS, she served as a consultant for various US government offices, including the Departments of Defense and State. 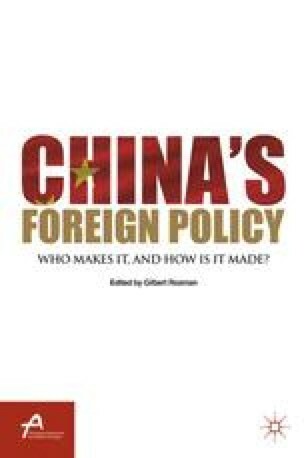 Glaser has written extensively on Chinese threat perceptions and views on strategic environment, China’s foreign policy, Sino-US relations, US-China military ties, China assessments of the Korean Peninsula, and Chinese perspectives on missile defense and multilateral security in Asia. Her recently published articles include “Tensions Flare in the South China Sea” (CSIS Report, 2011) and “A Shifting Balance: Chinese Assessments of U.S. Power” (CSIS Report, 2011). She received her B.A. in political science from Boston University and M.A. in international economics and Chinese studies from the Johns Hopkins School of Advanced International Studies.